No baking class today. Instead, I want to talk about turnips. I saw them at the Green Market last Wednesday, and they looked so fresh and pretty that I had to bring some home with me. It didn't help that Lynda was right there whispering in my ear about how good they were mashed with potatoes. And they had the most beautiful greens, which I am really getting into this season. We were not a big root vegetable family. In fact, other than carrots and potatoes (do those even count? ), the only root vegetable we ate with any regularity was canned beets, which I absolutely hated with a passion exceeded only by my hatred of black-eyed peas (which continues apace). Until I tasted my first pickled beet (which was the canned beets marinated overnight in a vinegar/salt/sugar mixture with onions). The vinegar brightened up the musky, somewhat earthy taste and completely transformed them into a slightly sweet, slightly tangy salad, served chilled, that complemented the flavor of any meat with which it was served. I still did not like them any other way, but at least I recognized some value to the beet, which developed into a full-blooded passion for them over the past couple of years. Other than that, we never came into contact with the likes of turnips, rutabagas or parsnips at our dinner table. Oh, I'm sure I must have come across them at some friend's house now or then, but to my knowledge they never passed my lips. Nor would I have wanted them to, given their reputation. Until I was in my twenties and we were visiting my grandmother in Houston. Her cousin Sylvia brought over a huge salad made with vegetables fresh from her garden, dressed with a tangy home-made honey-mustard vinaigrette. In addition to the easily-recognizable lettuce, cucumbers, tomatoes, carrots, and celery, there were round white thin slices of something that was bigger than a radish, but had a similar consistency. They were milder, and slightly nutty, and I fell in love with them. Imagine my surprise when Cousin Sylvia announced that they were turnips. It immediately changed my opinion of them, and I determined to explore them when I got home. And promptly forgot about them. Until I saw them at the market last week and (with Lynda's help) brought them home with me. I happened to have potatoes in the pantry, not something I generally keep on hand, so it seemed like fate. 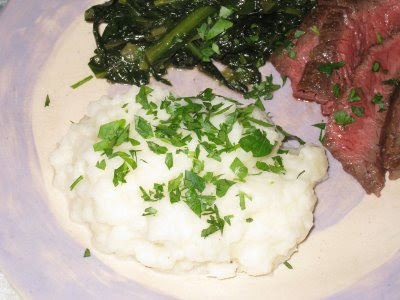 I looked up several recipes and techniques for making mashed turnips and potatoes. In my searching, I discovered that it's a Scottish dish called Clapshot. Although there seems to be some confusion (on my part, at least) over whether Clapshot uses turnips or rutabaga. 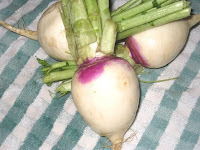 Some recipes that I saw called for turnips and some called for Swedish turnips or swedes, which is rutabaga. I don't think it matters much, and for my purposes the turnips worked out just fine. I love mashed potatoes, but I have found a new love in Clapshot. And I found I didn't have to use as much liquid (read milk and butter) as I do when I'm mashing potatoes all by themselves. And it's quick and easy, too. At only thirty minutes from start to finish, this would make a brilliant side dish to any meal. Place turnips and potatoes in saucepan and add cold water just enough to cover. Bring to a boil and remove any scum that forms on the top. Lower heat and cook at a simmer until tender, about 15-20 minutes. Drain the water, and return the pan with the turnips and potatoes to the burner, leaving it on low heat to get rid of any excess moisture, shaking the pan often to keep the turnips and potatoes from burning. Remove pan from heat. Add milk, cream and butter and mash with a potato masher. Adjust amounts of milk, cream and butter to taste. Add salt and pepper to taste. If not serving immediately, keep warm or reheat just before serving.